After Michelle Obama and Lady Gaga, golfer Tiger Woods has become the latest celebrity to get his own unauthorised biography in a comic book. Publisher Bluewater Productions Inc will release its one-shot issue 'Fame: Tiger Woods' in book stores, comic book shops and online. Other people who have starred in book include former Alaska Governor Sarah Palin and Facebook founder Mark Zuckerberg. The 32-page issue will be written by CW Cooke and illustrated by Marcelo Salaza. 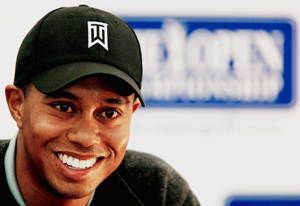 "Tiger Woods is, in most respects, the most famous golfer of all time. He may have had some recent troubles, but his life is one filled with very interesting tidbits," the Sydney Morning Herald quoted Jason Schultz, Bluewater's executive vice president, as saying.